Psoriasis is an inherited trait that causes a red, flaky rash that appears on the skin. Although this condition is not contagious, those unfamiliar with psoriasis may shy away from affected individuals. Not only is psoriasis a social burden, but it can also cause physical discomfort. Fortunately, our dermatologists are well-versed in psoriasis and the many treatments available to date. Our practice is one of few that offers PHAROS excimer laser treatments, which deliver focused narrowband UVB light that can provide remission of psoriasis for up to 6 months. We offer a wide range of treatments for psoriasis including excimer laser, Biologics, topical and oral medications. Psoriasis is a chronic condition. In order for a person to develop psoriasis, they must have a combination of the genes that cause psoriasis and be exposed to specific external factors, known as triggers, that cause the characteristic rash to erupt. The rash itself is a buildup of rapidly multiplying skin cells. The accelerated rate at which these cells multiply is caused by a problem with the immune system that is still not fully understood. Psoriasis flares vary in severity from mild, localized, flares with dandruff-like scale, to severe flares with large, thick plaques on multiple parts of the body. The rash of psoriasis cycles through times of improvement and worsening. Severity of the rash is also influenced by the type of psoriasis, the impact the illness has on the individual’s quality of life, and the individual’s susceptibility to side effects from treatment. About 10-30% of individuals with psoriasis will also develop psoriatic arthritis, which can cause stiffness, pain, swelling of the tendons and joints, as well as morning stiffness. As a chronic inflammatory condition, psoriasis also increases your risk of developing metabolic syndrome. According to the American Heart Association, metabolic syndrome is present in individuals that have three or more of the following risk factors: obesity, high LDL cholesterol, high blood pressure, or diabetes. Treatment of psoriasis is critical to the individual’s overall health. Although there is currently no cure for psoriasis, there are multiple treatments available that can help reduce or eliminate psoriasis symptoms. 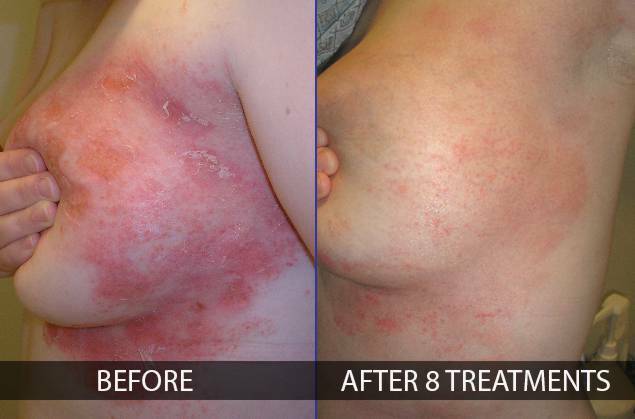 Treatment is customized to the amount of body surface area affected and the severity of the rash. We understand that not every individual responds to every type of treatment. That is why we offer several treatment options and often use them in combination with each other to help you find relief fast. Topical medications are applied directly to the affected skin to alleviate symptoms, slow cell growth, and reduce inflammation. They are often the first line of defense against psoriasis, especially with limited skin involvement. Narrowband UVB light is delivered by our PHAROS Excimer laser. The treatment is directed at the affected skin only, which spares the surrounding healthy tissue. If performed 2-3 times a week for 12-16 treatments, UVB light therapy can achieve remission of psoriasis that lasts for up to 6 months. The treatments are painless and side effects are minimal. Individuals with widespread psoriasis may require full body UVB therapy administered by a phototherapy booth. Oral medications are taken by mouth and affect the body systemically. They are typically used with topical medications or light therapy to provide the best results. Biological drugs are mostly given by injection or intravenous infusion. They are unique in that they do not affect the entire immune system, unlike traditional systemic drugs. Instead, biologics target specific parts of the immune system in order to block the action on specific cells and proteins that play a role in developing psoriasis or psoriatic arthritis.